In order to unlock the untapped potential of your brand and enhance its footprint, it is highly suggested to venture into Content driven marketing. As per Google, Mobile traffic is surging with every passing day and visitors wish to consume more and more content to educate themselves by what we call micro-moments. Please find below the details for the same. 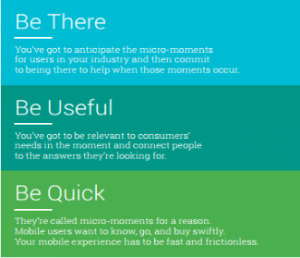 Micro-Moments: The moments when we turn to a devices – often a smartphone – to take action on whatever we need or want right now. These I-want-to-know, I-want-to-go, I-want-to-buy, and I-want-to-do moments are loaded with intent, context, and immediacy. These are critical touch points within today’s consumer journey, and when added together, they ultimately determine how that journey ends. 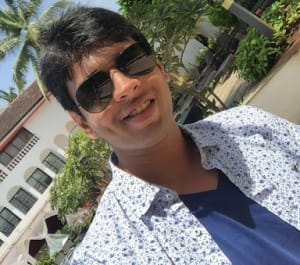 Having content rich materials would enable us to have strategic marketing approach focused on creating and distributing valuable, relevant, and consistent content to attract and retain audience and, ultimately, to drive profitable customer actions. Micro-Content: Being present in research phase of any visitor, the brand has the chance to address consumer needs in the moment, help move someone along their decision journey, and deepen their loyalty. 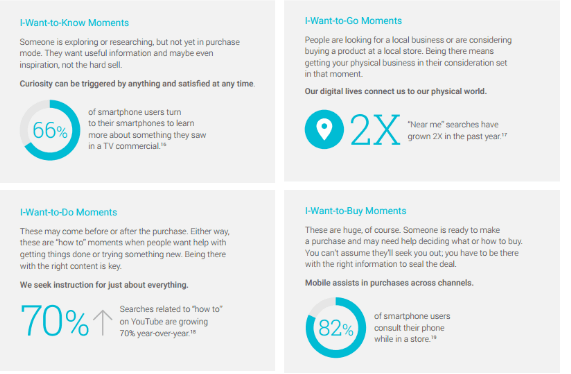 Have you started using Google’s micro-moments? If not, start early to take advantage of a potentially mammoth marketing technique.